CIC has devoted much of its research to analyzing institutions that promote global justice and international order. Multilateral issues, crisis management and global governance are subjects which have provided a wealth of research and analysis. Global goverance, is an incredibliy complex endeavour, undertaken by an equally complex group of international players. CIC presents challenging research that helps to clarify the often overlapping roles of international organization. CIC's research also examines peackeeping missions and prescribes recommendations for future operations. Can There be a US-Afghanistan Relation Beyond Security? The last decade has seen not one but two energy revolutions. The first, explosive growth in demand from Asia’s rising powers, fueled fears about scarcity and conflict. The second, an American revolution in technology and markets, is rapidly strengthening America’s hand in the world. There are major security consequences of these shifts, from Saudi Arabia to Africa to Russia, and the emerging powers are increasingly exposed to them—risks, as well as energy flows, are pivoting to Asia. All while a third revolution is struggling to be born, driven by climate change. Since 2008, energy and food markets—those most fundamental to human existence—have remained in turmoil. Resource scarcity has had a much bigger global impact in recent years than has been predicted, with ongoing volatility a sign that the world is only part-way through navigating a treacherous transition in the way it uses resources. Scarcity, and perceptions of scarcity, increase political risks, while geopolitical turmoil exacerbates shortages and complicates the search for solutions. In September 2015, the international community is expected to agree upon a universal set of sustainable development goals. This book is designed to help people from all backgrounds understand what was agreed upon at Rio+20 and the relevant UN Commissions, Conferences, and Summit that laid the foundation for Rio+20 and the new sustainable development goals currently being negotiated. Can India be a rule shaper? A Golden Age for Intervention? 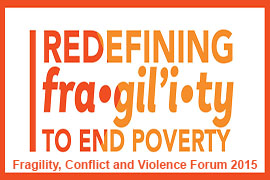 This year’s World Bank Fragility, Conflict and Violence Forum included a preview of the forthcoming OECD 2015 States of Fragility Report authored by CIC. Associate Director Sarah Hearn presented on the report’s highlights including financing options beyond official development assistant and smart aid solutions. Sign up to receive information about our latest work and events. You can opt-out at any time.